THE INVITATION to share in the rarefied, positive atmospheres contained within this debut release from the Sirkis Bialas International Quartet is tangible from an ensemble who evidently love what they create together. Acclaimed drummer and percussionist Asaf Sirkis’ 2013 album Shepherd’s Stories included amongst its jazz/rock solidity an enchanting, wordless cameo appearance by Polish vocalist Sylwia Bialas whose new-age tones were so intriguing as to suggest the development of a future musical collaboration. This conceptual spark has now ignited a synergetic new quartet with pianist Frank Harrison and bassist Patrick Bettison, featuring the broad scope of Bialas’ vocal dexterity. 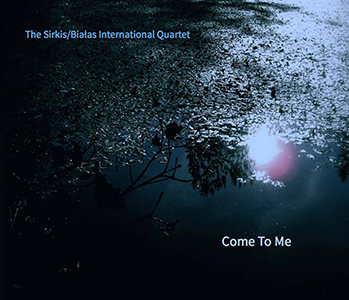 Dividing equally the ten compositions of Come To Me, Sirkis and Bialas create expansive landscapes (jazz, folk, world, prog) which are, in turns, contemplative, brooding and joyfully animated. Sylwia Bialas uses her voice either to shape her self-penned native lyrics or to explore more and more inventive instrumental avenues, frequently taking it through seemingly unreachable pitches and athletic rhythmic patterns. And the distinction here is the constant interaction with her fellow players; this is no ‘singer plus band’ set-up, but rather a fully integrated quartet whose conception feels unique. Patrick Bettison’s conversational electric bass style bears something of a resemblance to that of supremo Jeff Berlin, his fretless-like timbre a good match for Bialas’ various intonations; Frank Harrison displays all the sparky virtuosity and tender lyricism of his own trio albums and catalogue of recordings with Gilad Atzmon’s Orient House Ensemble; and former Orient House colleague Asaf Sirkis is as commanding as ever in providing the quartet’s complex rhythmic backbone plus typically infinite elaborations (his accomplished Konnakol skills need to be heard and seen to be believed!). Title track Come To Me offers a first glimpse of the band’s telepathy, its sparse, unison vocal and piano motif opening into Gustavsenesque transcendence, and Bialas’ lyrics evolving as liltingly sung improvisation. The empyreal lucidity of Dreams Dreams is haunting, with a measured pace maintained by Sirkis’ intricate cymbal patterns; and Vortex spins propulsively to Bettison’s mobile bass (entertaining to watch, live, the concentration required to hold his ostinato position against Sirkis’ audacious cross-rhythms) as Bialas stretches out broadly and magnificently. The otherwise quiet introversion of Sylwia Bialas’ Ismael is pierced by an emotional Middle Eastern vocal style, Harrison displaying his customary high-searching piano finesse, and Bettison’s harmonica extemporisations adding a sophisticated sense of mystery. Recognisably Sirkis’ writing, A Hymn possesses a certain ‘prog ominousness’, showcasing the effectiveness of Bialas’ voice as an instrument, whilst Mandragora builds into a bristling, cosmopolitan melting pot of so many ideas and influences – a great performance. Bialas’ lucent Polish lyricism in The One shines out, echoed by lofty instrumental delicacy; and the energy of Magnolia is infectious, Sirkis revelling in its percussive possibilities. Inspired by the subject of paranormal light trails in imagery, the band again summon their combined aptitude for conveying fragility in Orbs – spatial and otherworldly, it holds the attention so beautifully. And Sirkis’ rock-driven closer, Orgon, ripples to the eloquence of Bettison’s bass and Harrison’s electric piano, concluding with mischievous, disquieting electronic vocal effects from Bialas. Choose your moment with this album – but late evening (“In the silence of the night, in the depth of nothingness”) is when its magic is especially revealed, with the space reflecting every nuance that has been placed and captured so crystal-clearly. Launched at the EFG London Jazz Festival on 21 November 2014, claim that wonder for yourself at Bandcamp or JazzCDs. THERE ARE TIMES, on my long and increasingly rewarding musical journey, that I feel urged to express gratitude to particular musicians whose work has become a long-term source of enjoyment and inspiration. Falling firmly into this category is the instrumental and compositional prowess of reedsman Tim Garland, for many years now a respected mainstay of the British jazz scene. With a long roll-call of collaborators, projects and albums (most notably Chick Corea, Bill Bruford’s Earthworks, Dean Street Underground Orchestra and his own Lighthouse Trio), this most assured of saxophonists continues to develop and expand his artistic vocabulary, always with that warm signature vibrato. 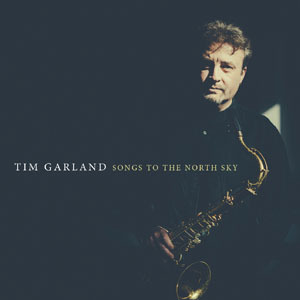 Signed to progressive label Edition Records, Garland has now released this double album, Songs to the North Sky – featuring an impressive, interchanging quartet (seven musicians in all), and expertly configured orchestral/percussive forces – which represents a still higher pinnacle of writing and performance. Part One focuses on the quartet material: eight tracks which bounce with characteristic ebullience, but also shimmer with expansive and often emotional beauty. Tim Garland’s dependable yet always exciting rhythm-maker, Asaf Sirkis, is key to proceedings, combining with the bubbling momentum of pianist Geoffrey Keezer and guitarist Ant Law on supercharged opener Uplift! The lightness of Kevin Glasgow’s electric bass and luminous piano of Jason Rebello refract the smooth golden rays of Little Sunshine, over which Garland’s tenor sings mellifluously. A Brother’s Gift finds a more reflective space, courtesy of Law’s steel strings and Sirkis’s distinctive custom kit – and often it’s the small details which please the ear, such as Garland’s ornamental phrasing, and also one particular end-of-phrase expiration here (odd, but true!). There’s a hint of Earthworks days in the leader’s command of Yes to This, John Turville and Ant Law both sparkling with positivity; The Perth Flight‘s propulsive energy offers a great showcase for both Garland and Rebello; and Farewell to Ed is a delightfully freer episode, enhanced by Law’s subtly overdriven electric guitar explorations. Garland has long been a champion of the bass clarinet, and his unmistakably fluid ‘voice’ is heard in Lammas Days (along with flute), an exuberant celebration of the magic conjured between these versatile musicians. A soprano and piano interpretation of Tom Bahler’s She’s Out of My Life (Michael Jackson) closes this sequence; in less capable hands, so easily mawkish and shallow – but Garland and Rebello elevate it to somewhere very special. The larger, themed work, Songs to the North Sky – supported by Sage Gateshead and Royal Northern College of Music – forms the second half of this release, and creatively draws on the dramatic open landscapes of Tim’s Garland’s adopted North East England homeland. Whereas 2008’s double album Libra found the composer writing on a larger, symphonic scale (the four-movement Frontier with the Royal Philharmonic Orchestra), there is an even greater organic balance here, successfully fusing saxes and percussion with The Royal Northern Sinfonia Strings. The result is genuinely compelling – a 50-minute episodic jazz/orchestral masterpiece which vividly paints Northumberland’s rugged coastlines and wide skies, Garland often hinting at 20th Century English string writing (Tippett, Vaughan Williams, Rodney Bennett) as well as Glass, Pärt, and even Celtic influences which are colorised by the energetic violin soloing of Magdalena Filipczak. Asaf Sirkis melds perfectly with the suspense of Neil Percy’s classical percussion; and John Patitucci’s four equally interspersed bass interludes are remarkable – certainly not bass ‘fillers’ but, rather, beautifully imagined, skilful miniatures in their own right. With both CDs regularly alternating in my car audio player for the past couple of weeks, I emphatically recommend this significant new release – and if you’re searching for stars (maybe over Kielder’s dark sky zone)… here they are ★★★★★. Available from 2 June 2014, listen to samples and buy here.